Media and Contents: Hard cover 8.5" x 11" (21.6 cm x 27.9 cm) format; 376 pages printed on glossy stock; around 400 photographs, many previously unpublished; 30 color side profiles plus two colour artworks (inside front and rear covers). Advantages: Detailed coverage of daily operations via official reports, first-hand accounts and historical analysis; excellent photos with helpful captions; attractive colour profiles bring the colours and markings to life; useful Appendices. By September 1944, the fate of the Reich must have been obvious to all. Luftwaffe personnel must have been especially aware, as they were suffering from lack of promised aircraft, pilots and fuel, yet they still had to deal with a vast air armada in the face of their own dwindling resources. And yet they continued the fight, regardless of the hopelessness of the situation, largely motivated by the belief that they had no choice other than to protect their homeland. Jagdgeschwader 300 was in the thick of this fight in the closing months of the war, facing the best that the RAF and USAAF could throw at them as the front lines were forced back to the German border and beyond. 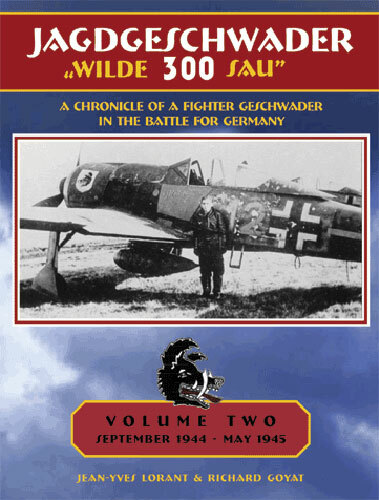 Volume Two of "Jagdgeschwader 300: A Chronicle of a Fighter Geschwader in the Battle for Germany ", picks up the story where Volume One left off. In September 1944, JG 300 was supporting the German recapture of Arnhem, achieving a number of successes, but also losing a number of its key personnel in the process. By the end of November, the situation was becoming more desperate, with no chance of reinforcements and the rapid escalation of Allied air supremacy. The book contains nearly 400 glossy pages between its hard covers. The text covers almost daily operational history of JG 300 during this dire period. Despite the size of this tome, the narrative is quite lively and readable thanks to the regular inclusion of first-hand accounts and historical analysis. The photographs form a historical perspective of their own, and captions are quite helpful with technical and operational insights regularly made. Wherever possible, the captions also include a brief description of the markings (eg "Red 3" etc). 30 colour side profiles are also included, bringing these late-war fighters to life. In addition to the operations chaos of the German war machine, this period also saw a great deal of change in camouflage and markings. A number of these transitions are illustrated in the profiles. The book is rounded out with Appendices that cover the Order of Battle on 3 May, 1945; a JG 300 loss list from 18 September 1944 to the end of the war; a victory list for the same period; Staffel colours and Gruppe symbols and a Glossary. As the title suggests, this book is principally a chronicle of JG 300's operations from September 1944 until the end of the war. Even so, it is more than just an operational history thanks to the excellent selection of photographs and large offering of colour artwork. The story presented by the authors is as fascinating as it is tragic, and will be required reading for students of Luftwaffe history. Modellers will also find plenty of inspiration for original Bf 109 and Fw 190 subjects with striking markings.